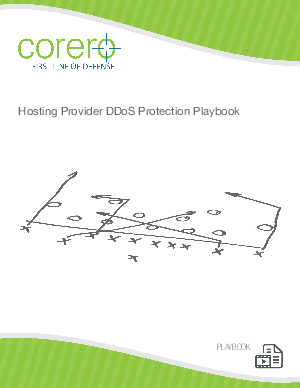 Hosting providers are often the targets for damaging DDoS attacks, since the number of customers they service and theaggregate Internet peering bandwidth they utilize greatly increases their attack surface. An attack on a single client of the provider— such as a high-traffic gaming service—can create major collateral damage to other hosted customers. These innocent bystanders are placed in the unfortunate situation of suffering from second-hand (damage) because they are hosted on the same shared facilities as the intended victim, and the results can be devastating for both the provider and their customers. Hosting providers and their customers can experience hours or even days of downtime, and the situation is becoming morechallenging due to the increased accessibility of tools and limitless attacker motivations. The sophistication and sheer brute force of recent attacks suggests an escalation of tactics to new levels of severity. As the size, complexity and regularity of DDoS attacks on hosting providers and their customers continues to increase, providers have to field new plays to mitigate risks and avoid the crippling downtime that comes with being the victim of DDoS attacks. Few hosting providers today offer sufficient protection from DDoS attacks, so those that can implement robust DDoS attackprotection will be able to more effi ciently protect their hosted infrastructure and gain a competitive advantage in the marketplace. They’ll also be positioned to create incremental revenue streams from high-value, managed DDoS attack protectionservices.